Habitat for Humanity volunteers gather at Anderson Gardens’ dedication ceremony. A new partnership between Habitat for Humanity Edmonton and the Capital Region Interfaith Initiative will see volunteers assisting with our community’s first Interfaith Build. The initiative will begin May 2nd and will conclude on May 31st. 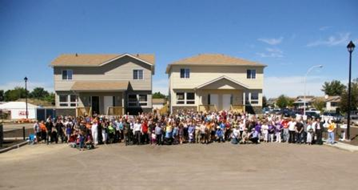 With support from the Capital Region Interfaith Housing Initiative, Habitat for Humanity Edmonton will recruit five volunteers per day up to a maximum of 110 from various faith communities. These individuals will work alongside other Habitat for Humanity Edmonton volunteers to assist with various tasks at the Anderson Gardens build site, which is Habitat for Humanity Edmonton’s largest project to date. Volunteer shifts will commence Tuesdays to Saturdays from 8:30 pm – 4:30 pm, with the exception of May 19th, the long weekend Monday. Volunteers are encouraged to sign up for as many or as few shifts as they prefer. Congratulations to Habitat for Humanity Edmonton and the Capital Region Interfaith Initiative for spearheading such an important and exciting project. For more information about the Edmonton Interfaith Build, contact Angela at angela@hfh.org or phone 780-451-3416 ext 223.